How long has it been since you put yourself to the test? Here are some tips on setting up your own qualifications course. A U.S. Army soldier trains with a Glock 19 shooting from the kneeling position at Warriorschool in the Arizona desert. Uncle Sam is currently issuing 9mm Glock 19s, along with SIG 228s and Beretta M9s, to certain personnel. During my law enforcement career I had complete confidence in my ability to protect life and property because I routinely qualified with the firearms that I carried on and off duty. Qualifying with firearms enabled me to go into harm's way knowing that I was a better shot than the average criminal who had no formal training and never qualified. Have you qualified lately? Or, to put it another way, have you had your marksmanship and firearms handling skills properly tested? I am referring to a law enforcement-style timed course of fire with at least one combat reloading drill that involves shooting at a man-size target at distances ranging from three to 25 yards. The key word in this discussion is "lately." As a retired U.S. Customs agent, I am authorized to carry firearms on an interstate basis pursuant to H.R. 218, the Law Enforcement Officers Safety Act of 2004, provided that I qualify with a handgun once a year. Since this law requires qualified individuals to meet the firearms training standards of a law enforcement officer in their state of residence, I have to qualify with a personally owned handgun on an unfamiliar course of fire. The quarterly firearms qualification course that I used in the Customs Service is different than the course of fire approved by the authorities in my state of residence. The first time I qualified under H.R. 218 I used a 9mm SIG 228. When it came time to renew my certification I decided to qualify with both a semiauto and a revolver so I could have more flexibility in choosing a gun for concealed carry. The moment of truth came when I loaded six rounds in my Smith & Wesson Model 64 .38-caliber revolver with a two-inch barrel and waited for the instructor to signal me to draw and fire from the 25-yard line. The fact that I just finished qualifying with my 9mm SIG 229 and gained an almost perfect score did not help much when I realized that it had been several years since I qualified with a short-barreled revolver. The author checks out a Heckler & Koch P2000 with a DAO Law Enforcement Modification (LEM) trigger. Fortunately, I had no problem qualifying and was certified to carry both semiauto pistols and revolvers on an interstate basis for another 12 months. That day I felt like a rookie in the police academy when I spotted all the holes in the right place, except for a single 9mm round and two .38 Special rounds that I put out of the scoring area into the target's right arm when I was firing at 25 yards. After I qualified I decided I had to write an article on this subject because with the exception of divine intervention, nothing can do more to help you win a gunfight than confidence. And naturally, the best way to acquire confidence is to train hard and be tested in various ways. This police officer is running through a practical qualifications course with his Glock. Note the two-hand hold in one photo and a weak-hand shot in the other. It's always a good idea to practice with your weak hand. One way to hone your gunfighting skills is to attend scenario-based force-on-force training with simulated munitions. For obvious reasons, training with non-lethal simulated munitions, such as General Dynamics' Simunition products, is significantly more realistic than engaging paper targets because paper targets don't shoot back. While wearing the proper safety equipment and protective clothing, you can use a pistol with a conversion kit to challenge other suitably armed individuals in a very realistic fashion. Paintball and Airsoft guns can also be used to develop your tactical capabilities. Simunition products are only available to law enforcement personnel and government agencies. Even if you train with simulated munitions, you should continue to develop your marksmanship skills with a handgun by engaging paper targets. Since many legally armed individuals have no law enforcement or recent military training, I thought it might be helpful to provide some suggestions on how you can train and qualify. While I don't expect the average legally armed civilian to participate in advanced or specialized firearms training, I do think it is appropriate to practice as often as possible and maintain some level of acceptable proficiency. The author's youngest son is training here with his .45 ACP Kimber Warrior 1911. Shown is a close view of him executing a combat reload from his DeSantis N81 ankle holster. Fortunately, it is possible for citizens to receive basic and advanced firearms training at various well-respected private training schools. Even though these courses can be expensive, they are worth every penny, especially for those who have never received any formal firearms training elsewhere. While it is not absolutely necessary to qualify with every handgun you own, you should be tested with the handguns that you carry on a regular basis. Becoming proficient with different types of ammunition is also critical. gh rounds of your hollowpoints from different distances to see how your gun performs with higher-velocity ammo. In order to qualify, a person must be tested on a course of fire that determines his ability to shoot accurately and then achieve a passing score. While bull's-eye targets are often used for competition shooting, law enforcement agencies have transitioned to targets that depict a human shape of some kind. You can also use politically correct targets that are more non-descript. A 50-round law enforcement course of fire that designates each hit as being worth five points and has a perfect score of 250 points and a minimum passing score of 210 translates to 84 percent as the minimum passing grade. This is a very stringent passing score and one that leaves little margin for error. One particular federal agency uses a 60-round course of fire that requires a minimum score of 210 out of 300, or 70 percent. The following 30-round qualification course is used by the National Park Service. It requires NPS rangers and special agents to score a minimum of 21 hits within the four and five rings of a Transtar II Target. Civilian shooters can score this course of fire by deducting five points for every round that fails to strike a vital area of any man-size target. This means that if you establish the passing score at 75 percent you can only miss five shots. The same course is also used for night qualification with the exception that all rounds that are fired at 25 yards for daytime qualification are fired at 15 yards. Follow the instructor's commands at all times. Never leave the firing line without being instructed to do so, and never turn around with a loaded or unloaded firearm in your hand once you position yourself on the firing line. If you have a problem or question, you are directed to face forward and raise your non-gun hand. You must remain in that position until an instructor arrives by your side. 1. At the three-yard line, on command draw and fire three rounds in three seconds using a hip-level or point-shoulder position using one or two hands (shooter's choice). 3. On command with the line safe and your handgun holstered, move to the seven-yard line. 4. At seven yards, face the target, then on command draw and fire two rounds in three seconds using a two-handed point-shoulder position. When finished firing, decock or make the handgun safe and reholster. 6. At seven yards, scan the target area, then fire two rounds, weak-hand only. 7. Repeat number 6, then holster your weapon. 8. At seven yards while facing the target with your weapon loaded and holstered, draw and fire two rounds from a point-shoulder position using two hands. Do a combat reload, and fire two more rounds, all in a total of 12 seconds. When finished, decock or make the gun safe and reholster. 9. 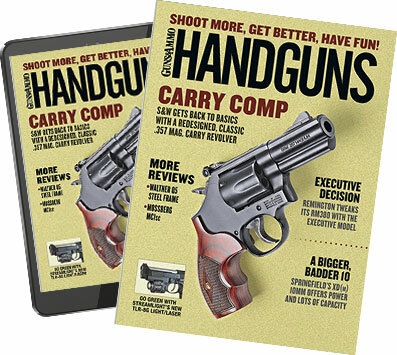 On command with your handgun holstered and the firing line safe, move to the 15-yard line. 11. At 15 yards while facing the target from behind low cover (or while using a kneeling position with simulated cover), on command draw and fire three rounds in four seconds. Decock or make the handgun safe and reholster. 12. On command with your handgun holstered and the line safe, move to the 25-yard line. 13. While facing the target at 25 yards, on command draw and fire three rounds in eight seconds using both hands from a standing strong-side barricade position, then decock and make your handgun safe before you reholster. 14. At 25 yards while facing the target, on command draw and fire two rounds in five seconds from a standing weak-side barricade position. Decock and make your handgun safe before you reholster. 15. At 25 yards while facing the target, on command draw and fire one round in three seconds from a low-cover or kneeling position using two hands. Once you are finished firing, decock or make your handgun safe before you reholster and stand. Do not go downrange to score your target unless the line is safe and you are authorized or instructed to do so. In law enforcement circles anyone who fails to achieve a passing score is given at least one more opportunity to qualify. Civilian gun owners should be given as much time as necessary to qualify and should have patience if they have problems achieving a passing score. If you're unable to qualify after two attempts, you should take a break before you continue. You may also want to consider changing the type or caliber of handgun you carry, if that is what it takes to make it possible for you to qualify. In my opinion, legally armed senior citizens should not be expected to qualify under the strictest of standards but should be able to consistently hit a man-size target at close combat distances. These U.S. Department of Defense personnel are training with their 9mm Glocks and Berettas before being deployed to their missions in the War on Terror. At their request, the author's photos do not show their faces. Five rounds at the three-yard line. Five rounds at the seven-yard line with two hands and a combat reload of another five rounds using your weak hand. Five rounds at the 15-yard line with two hands and a five-round combat reload. Three rounds at the 25-yard line from a standing position and two rounds from the kneeling position, for a total of 30 rounds. You can modify the same course for a six-shot revolver by adding one round to each station for a total of 36 rounds. It is also important to practice and qualify in low-light conditions. One way to accomplish this is to dim the lights in an indoor range. Another option is to purchase a pair of DeSantis Low Light Simulator Goggles that allow you to train in low-light conditions in broad daylight. Every time I qualify I leave the range feeling confident that I can hit the mark with the firearms that I use for personal protection and home defense. While shooting at tin cans and metal plates is fun, I strongly suggest that you qualify on a regular basis with the firearms that you carry and use for personal protection. You will not regret your decision to do so. orschool for allowing him to observe and photograph classes of U.S. DoD personnel training in Arizona.